Chest thoracotomy tube (CTT) management can seem challenging, so let evidence-based practice guide you. Familiarize yourself with the chest drainage units used in your organization, so you’re prepared to care for patients with a CTT. Use checklists as a visual aid, reminder, and quick reference about monitoring and care of patients with a CTT. CHEST thoracotomy tubes (CTTs) have been around for centuries, but not until the late 1950s did they become standard of care for treating empyema, pneumothorax, hemothorax, hemopneumothorax, and pleural effusion. CTTs can be life-saving, but only if managed based on current best evidence. Understanding CTTs begins with understanding how breathing works. Ventilation, a two-part process, begins with inhalation. The chest cavity expands, mostly through diaphragm contraction, lowering pressure inside the chest cavity and effectively creating suction. Air moves from the atmosphere of greater pressure and into the thoracic cavity, where pressure is lower. This is negative pressure ventilation. The second part of ventilation, exhalation, is passive as the diaphragm and other respiratory muscles resume their resting configuration. The decreased size of the lungs reverses the pressure gradient, and air is forced out into the atmosphere. Between the outer lining of the lungs and the inner chest wall lies the pleural space, which normally is lubricated by pleural fluid in the amount of 0.2 mL/kg (10 to 20 mL for average-size adults). When pleural integrity is breached, excess blood, serous fluid, or air accumulates. The body can handle small amounts of extra pleural fluid or air, but large amounts (≥ 300 mL) impede ventilation. An extreme case is tension pneumothorax, which is characterized by progressive accumulation and trapping of air in the pleural cavity, causing pressure buildup that obliterates space for adjacent structures (lungs, vena cava, and heart). CTTs drain fluid and air in the pleural cavity to promote lung re-expansion. Now that you understand the physiology, you’re ready to dive into the details of CTT management. When a provider orders a CTT, your responsibilities include verifying patient identification, ascertaining that informed consent has been obtained (except in emergencies), and determining patient understanding of the procedure. Explain the procedure to the patient, assess his or her comprehension, answer questions within your purview, and allow the patient to express his or her anxiety. Taking these steps will improve patient cooperation during the procedure. Hemorrhage is a potential complication of chest tube placement, so review the patient’s medications (look for heparin, warfarin, apixaban) and coagulation profile (activated partial prothrombin time, international normalized ratio, platelets, and fibrinogen). Anticoagulant use is a relative contraindication to CTT insertion, but the provider will weigh the risks and benefits. You’ll also be involved in gathering supplies, administering antibiotic and pain prophylaxis as ordered, assisting with selecting and imaging the insertion site, positioning the patient, ensuring sterile technique, securing the tube, and confirming placement. Gather supplies: As ordered by the provider, prepare the CTT insertion tray, tube, and drainage system. (See Small bore or large bore?) Set up chest drainage units (CDUs) per the manufacturer’s recommendations. For underwater seal CDUs, the most important preparation is filling the water seal chamber with sterile water or sterile normal saline to the prescribed level (2 cm). As part of your safety and contingency preparations, keep petroleum gauze and a rubber-tipped clamp at the patient’s bedside, especially during transfers, in case of complications. Antibiotic and pain prophylaxis: Antibiotic prophylaxis is recommended only for patients with traumatic chest injuries. In addition to 1% lidocaine injected around the incision site to reduce pain, premedication with an I.V. analgesic and/or an anxiolytic is recommended. Site selection and imaging: CTTs are usually inserted in the 4th or 5th intercostal space just anterior to the midaxillary line. Imaging guidance during CTT insertion is strongly recommended, so make sure that a functional and disinfected ultrasound machine is in the patient’s room before the procedure. Patient positioning: Optimal positioning during the procedure requires balancing the patient’s overall condition and comfort with the provider’s access to the anatomic structures. Guidelines indicate that the preferred patient position is semi-reclined at a 45-degree angle, boosted by a small wedge or linen to fully expose the side to be operated on. The patient’s forearm is raised above the head, and the hand is tucked behind the head. Secure any other potential obstructions to the surgical site, such as a pendulous breast, before the procedure. If the patient can’t tolerate lying in bed, he or she may assume the orthopneic position, sitting up with an overbed table in front to lean on and a pillow placed under the arms for comfort. This allows maximal expansion of the lungs while exposing the midaxillary area. Small bore or large bore? Chest thoracotomy tube drains are either small-bore or large-bore. Aseptic technique: Guidelines recommend full aseptic technique, which includes skin cleansing, sterile gloves, drapes, and gowns. 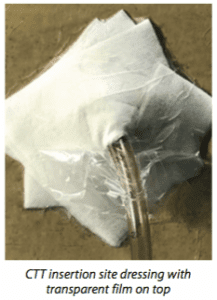 The classic dressing for chest thoracotomy tube (CTT) insertion sites is petroleum gauze held in place by a secondary dressing of sterile, 4″ x 4″ sponge gauze secured with tape. Studies suggest that petroleum gauze macerates skin over time. Other dressing materials have been explored, including dry occlusive dressings, standard gauze, and transparent film. 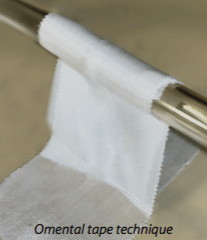 A randomized controlled trial by Gross and colleagues found no significant difference in the effectiveness of petroleum gauze, dry sterile dressing (bordered gauze), and no dressing. However, the sample size was small, so the result can’t be generalized. Transparent film can be used alone or as a secondary dressing to avoid using tape. It also allows better visualization of the CTT to monitor for tube migration. Insertion site dressings: The literature presents several ways of dressing a CTT insertion site, but little evidence supporting their effectiveness exists. (See Insertion site dressing options.) In most practice settings, the provider who placed the CTT selects the dressing. The nurse performs postinsertion dressing changes according to organizational policy. Confirming placement: An X-ray usually is needed to confirm CTT placement after insertion. Studies indicate that daily chest X-rays to monitor placement aren’t warranted. 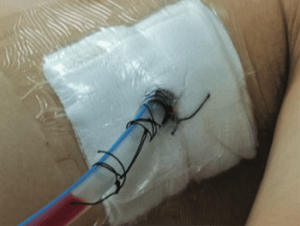 In addition to suturing, a chest thoracotomy tube (CTT) should be secured with tape a few inches below the insertion site to prevent accidental dislodgment and dependent loops. The omental tape technique fastens the tube securely while allowing some distance between the skin and the tube to prevent kinking and tension at the insertion site. Too many nurses think that more tape leads to more secure CTTs, but the evidence doesn’t support that. In addition to being wasteful and unnecessary, excessive tape may impede chest wall expansion. It also can increase moisture collection between the skin and the adhesive, which may lead to infection. Both small-and large-bore CTTs can be attached to either category of CDU. The provider selects the appropriate CDU type for the patient by anticipating the amount of drainage and whether suction will be needed. 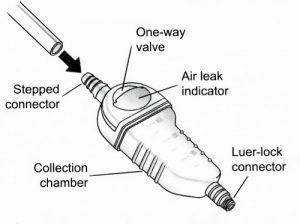 A wet-suction CDU has a suction control chamber, while the dry-suction CDU replaces this with a regulator and suction monitor bellows. A CDU also has additional features such as an air leak monitor, needleless access port, and a positive pressure release valve. See an image of a CDU at opentextbc.ca/ clinicalskills/chapter/10-7-chest-drainage-systems/. Underwater seal CDU Drainage collection chamber: Drainage collection chambers, which typically have a 2,100-mL capacity, have calibrations and numeric markings for measuring output. Best practice is to mark the drainage level and write the date and time of each reading on the face of the CDU. The provider orders output monitoring frequency, but at a minimum, do it at the start and toward the end of your shift. Water seal chamber: The water seal chamber prevents atmospheric air from going into the pleural space. Any air in the pleural space will drain through the CTT and pass through the collection chamber and into the water seal chamber, where it appears as intermittent bubbling. This is normal and expected. Continuous bubbling in the water seal indicates an air leak. Check all connections for looseness and secure with tape. Complete absence of bubbling may indicate chest re-expansion or a system malfunction. Tidaling or oscillations also are observable in the water seal chamber and coincide with respirations. Tidaling is normal; its absence may indicate chest re-expansion. Suction control mechanism: CDUs can be used with or without suction, but all CDUs have built-in mechanisms to regulate the amount of suction being applied. To apply suction, connect the CDU to a wall suction unit, and turn the gauge to no less than –80 mmHg (medium suction setting). Note that not all of this –80 mmHg of suction goes into the patient. The amount of suction applied to the patient is regulated by the CDU, not the wall gauge. There are two suction control mechanisms—wet versus dry. • manufacturer-recommended maneuvers to achieve more suction than that provided by the chamber’s –20 cmH2O maximum. • less chance of fluid spills. In cases of pneumothorax where only air and a scant amount of drainage are expected, one-way valve devices may be more practical. When using this type of CDU, note that you won’t be able to easily observe air leaks, monitor intrapleural pressures, or use suction. Smaller, one-way valve chest drainage units (CDUs) are portable and more practical when only air or a small amount of drainage is expected. If you follow a few practical tips, managing patients with a CTT won’t be complicated. Monitor patient response. Focus your assessment on the patient, not the equipment. Every 2 hours (or as needed), assess and document the patient’s level of consciousness, orientation, vital signs (especially respiratory rate, depth, and effort), breath sounds, and oxygen saturation. Every 8 hours (or as needed), inspect the CTT insertion site for drainage, subcutaneous emphysema, and tube migration. Maintain CTT and drainage system integrity. Remember that the CTT system will work only if it’s intact. Any breach in the system—even a loose connection—can allow atmospheric air to get sucked into the thoracic cavity, causing patient harm. Secure and monitor all points of connection. Activities of daily living (ADLs) such as bathing, repositioning and turning, and ambulating can loosen or dislodge CTT connections. Assist patients during any of these activities. Ensure continuous drainage by gravity. The whole system should be kept patent, and the CDU must be positioned lower than the insertion site. • Keep all tubing free of kinks, occlusions, and dependent loops; they can dramatically increase intrathoracic pressure in just a few minutes. • CTTs are rarely clamped because it heightens the risk of causing tension pneumothorax. If clamping is done, usually it’s a trial before CTT removal. Clamping might also be done after pleurodesis, which is a procedure to mechanically or chemically obliterate the pleural space where fluid buildup emanates. Clamping always requires a provider order. Pay attention to the water seal chamber. If you witness excess bubbling, assume that the seal is being breached and air is leaking. Check and secure all connections. Note that tidaling and intermittent bubbling are normal. • intrathoracic pressure. Intrathoracic pressure can be gauged by looking at the water seal chamber. Safety vents in CDUs dispel excess negative pressure and any buildup of positive pressure. Intrathoracic negativity can be damaging if it exceeds –20 cmH2O. It can be caused by respiratory distress, coughing, and crying, as well as activities such as stripping or milking the tube. You can remedy persistently high intrathoracic negativity by manually pressing on the high-negativity vent at the back of the CDU. Important: This can be done only if suction is being applied. • suction pressure. Suction pressure usually is a problem only in wet suction systems. If the ordered suction amount is –20 cmH2O, then the suction control chamber should be filled with sterile water to that exact level. You can add (or remove) sterile water from the suction control chamber as needed. Monitor drainage. Monitor the amount and quality of drainage. Err on the safe side and notify the provider if output exceeds 100 mL. Any drastic increase or decrease in volume or change in quality (color, bloodiness, or purulence) of the drainage may indicate a problem and also requires notifying the provider. Prepare for untoward events. When caring for patients with a CTT, keep petroleum gauze and a rubber-tipped clamp at the bedside. Be prepared to address some of these common events. • Tube dislodgment. Dislodgment requires prompt application of petroleum gauze to the insertion site and provider notification. • CDU contamination or malfunction. If the CDU is disconnected, contaminated, or malfunctions, it may have to be changed while the CTT remains secured in its insertion site. In these situations, disconnect the CTT from the CDU and promptly submerge it 1 to 2 inches in a 250-mL bottle of sterile water to establish a seal. Ask a coworker to obtain a new CDU and reconnect the CTT. Another option is to clamp the CTT using a rubber-tipped clamp or forceps, but only for a few minutes to obtain supplies. Remember that clamping poses the risk of tension pneumothorax. • CDU knocked over. If the CDU gets knocked over, promptly return it to its upright position and check all connections. Although most CDUs have mechanisms to contain fluids in their respective chambers, thoroughly inspect them. Check the water seal chamber first, and make sure that the sterile water is at the 2-cm mark. In wet suction CDUs, check the suction control chamber and add sterile water as needed. Don’t milk or strip. Milking or stripping refers to aggressive maneuvers that force large blood clots into the CDU. This sharply increases intrathoracic pressure and can harm the patient. If needed, pinch and release the tube, one small segment at a time, until clots fall off the tube. calling the nurse or provider if any change in breathing pattern occurs. Use this comprehensive chest thoracotomy tube (CTT) checklist at least once every shift as a reminder for monitoring and managing patients with a CTT. The CTT may be discontinued when evidence of lung re-expansion is observed, such as improved X-rays, symmetric chest expansion, absence of tidaling, and improved overall respiratory function. However, the primary consideration for CTT removal is the amount of drainage and/or air leak. Traditionally, the CTT is removed when drainage is less than 100 mL/day. Current literature is more aggressive, citing that CTTs can be removed safely when output is less than 400 mL/day, in the absence of air leaks. • administer pain medications and/or anxiolytics as ordered. After the CTT is removed, an X-ray is taken and you will continue to monitor the patient’s respiratory function, vital signs, CTT postinsertion site, and overall comfort level. Evidence supports the use of checklists to improve nursing care of patients with a CTT. 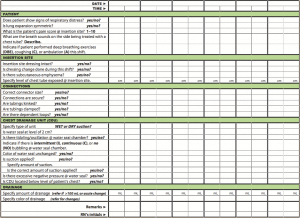 Checklists provide a visual aid, reminder, and quick reference about monitoring and care. (See CCT checklist.) And when taking care of a patient with a CTT, take a moment to breathe and focus on the task at hand. Remember the basics and stay calm. You got this. Randelle I. Sasa is an assistant professor of nursing at Queensborough Community College, City University of New York in Bayside. ATLS® Student Course Manual: Advanced Trauma Life Support. 10th ed. Chicago, IL: ACS American College of Surgeons; 2018. Bauman M, Handley C. Chest tube care: The more you know, the easier it gets. Am Nurse Today. 2011;6(9):27-32. Benton IJ, Benfield GF. Comparison of a large and small-calibre tube drain for managing spontaneous pneumothoraces. Respir Med. 2009;103(10):1436-40. British Thoracic Society. BTS Pleural Disease Guideline 2010. Thorax. 2010;65(suppl II):ii1-ii76. Coughlin SM, Emmerton-Coughlin HM, Malthaner R. Management of chest tubes after pulmonary resection: A systematic review and meta-analysis. Can J Surg. 2012;55(4):264-70. Gan KL, Tan M. Evidence-based management of patients with chest tube drainage system to reduce complications in cardiothoracic vascular surgery wards. Int J Evid Based Healthc. 2015;13(2):58-65. Ganapathy A, Adhikari N, Spiegelman J, Scales DC. Routine chest x-rays in intensive care units: A systematic review and metaanalysis. Crit Care. 2012;16(2):R68. Gross SL, Jennings CD, Clark RC. Comparison of three practices for dressing chest tube insertion sites: A randomized controlled trial. MedSurg Nurs. 2016;25(4):229-31,50. Halm MA. To strip or not to strip? Physiological effects of chest tube manipulation. Am J Crit Care. 2007;16(6):609-12. Hernandez MC, El Khatib M, Prokop L, Zielinski MD, Aho JM. Complications in tube thoracostomy: Systematic review and metaanalysis. J Trauma Acute Care Surg. 2018;85(2):410-6. Hernandez MC, Zeb MH, Heller SF, Zielinski MD, Aho JM. Tube thoracostomy complications increase cost. World J Surg. 2017;41(6):1482-7. Hinkle JK, Cheever KH. Brunner & Suddarth’s Textbook of Medical-Surgical Nursing. 14th ed. Philadelphia, PA: Wolters Kluwer; 2017. Jeffries M. Evidence to support the use of occlusive dry sterile dressings for chest tubes. MedSurg Nurs. 2017;26(3):171-4. Morales CH, Mejía C, Roldan LA, Saldarriaga MF, Duque AF. Negative pleural suction in thoracic trauma patients: A randomized controlled trial. J Trauma Acute Care Surg. 2014;77(2):251-5. Venuta F, Diso D, Anile M, Rendina EA, Onorati I. Chest tubes: Generalities. Thorac Surg Clin. 2017;27(1):1-5. Zardo P, Busk H, Kutschka I. Chest tube management: State of the art. Curr Opin Anaesthesiol. 2015;28(1):45-9.